They’re still under threat from global warming, but corals in the Great Barrier Reef have enough genetic variation to survive for at least another century, or more than 50 years longer than previous estimates have suggested. AUSTIN, Texas — Using genetic samples and computer simulations, evolutionary biologists have made a glass-half-full forecast: Corals in the Great Barrier Reef have enough genetic variation to adapt to and survive rising ocean temperatures for at least another century, or more than 50 years longer than previous estimates have suggested. The results of their work are published in the April 19 edition of the journal PLOS Genetics. Matz’s co-authors are Galina Aglyamova at UT Austin, Eric Treml at the University of Melbourne and Line Bay at the Australian Institute of Marine Science. The source of the coral’s resilience lies in genetic variations across connected but widely dispersed populations. One of the major reef-building corals on the Great Barrier Reef is a species of staghorn coral called Acropora millepora. 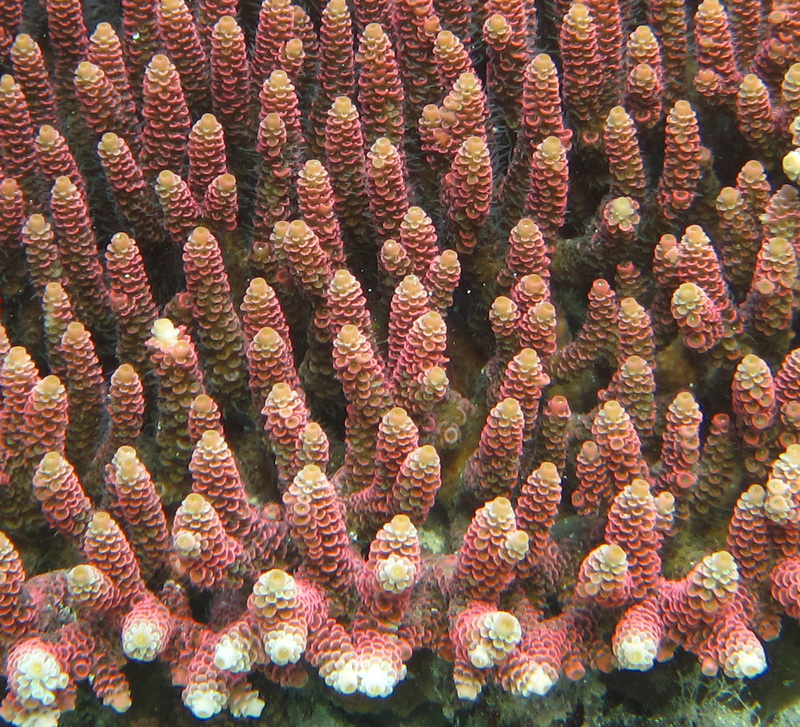 In a 2015 paper in the journal Science, Matz and his colleagues demonstrated that within this same species of coral, some individuals have genes that make them more heat tolerant than others. Each coral colony produces a million larvae every year, and those larvae float on currents for up to several weeks until settling on a new reef. As conditions change in a particular location — for example, the water warms — individuals of the species that are less adapted die while better-adapted individuals thrive. Over time, if incoming larvae supply genetic variants for increased hardiness, the local population shifts to the hardier variety. 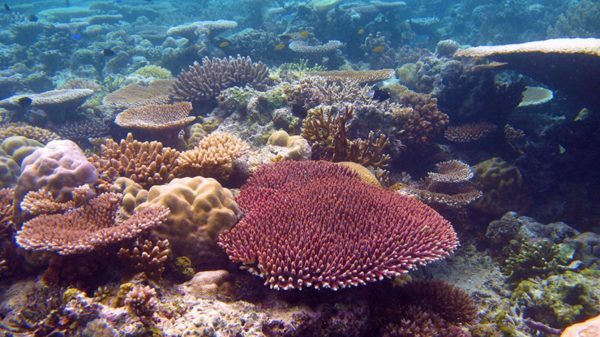 The researchers adapted methods used to study how human populations have evolved across the globe to study how connected populations of staghorn corals on the Great Barrier Reef evolve. To reconstruct patterns of larval migration, a key driver of population-level evolution, they used thousands of genetic variants from five sites across the reef, as well as a biophysical model of larval dispersal via currents. Some researchers are attempting to create super corals in the laboratory, including through genetic engineering, but that is not what Matz recommends. Rather, he thinks researchers should focus on learning more about genetics and passing that information on to those involved in conservation efforts. Matz thinks efforts to alter corals in the lab are misguided — in part because scientists don’t really know how coral genes work and also because there is a more efficient way to help corals evolve. Next, the researchers plan to conduct experiments to verify that their model’s predictions match how real coral populations are currently evolving. They plan to combine genetic samples taken from corals at five sites across the Great Barrier Reef in the early 2000s with ones taken at the same sites over the next five years to build a 20-year map of actual genetic changes that can be compared with model predictions. According to a report of the Intergovernmental Panel on Climate Change in 2014, without major reductions in greenhouse gas emissions, global surface temperatures are forecast to rise more than 2 degrees Celsius by the end of the century (relative to the start of the century). The oceans absorb more than 90 percent of the heat trapped by increases in greenhouse gas emissions. Corals live in colonies with colorful algae that provide them nutrients. When the surrounding water warms too much, the algae can produce toxins, forcing corals to expel them, leaving the coral a ghostly white. Unless temperatures drop again soon, the corals may die of starvation or disease. A major bleaching event killed large sections of the Great Barrier Reef in 2016 and 2017. This research was funded by the U.S. National Science Foundation, the University of Melbourne, the Coral Reef Alliance, the Queensland Government and Australian Institute of Marine Science. The project relied on high-performance computing resources of the Texas Advanced Computing Center at UT Austin.